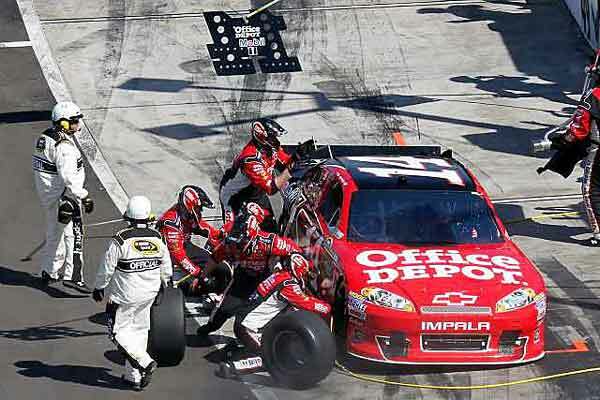 AVONDALE, AZ – In the second race of the “Fuel Injection Era” Tony Stewart experiences a failure dashing his hopes for a good finish. On lap 249 of the 312 lap Phoenix 500, Stewart shut his engine off to conserve fuel. The engine wouldn’t restart, and Stewart needed a push from a wrecker to get it restarted. "A breaker switch in the system that's there -- I don't understand totally why it's there -- but it kicked off," Addington said. "It doesn't need it when it's running. But when he shut the car off, if you ever shut it off, it won't let the car fire back up… We had no way of knowing that's what had kicked off, or that it would do that under racing conditions. It's not what we wanted. We had a fast car and thought we would get a top-five [finish] out of it, but that's the way it goes sometimes." Lesson One – Carburetors do not have breakers. 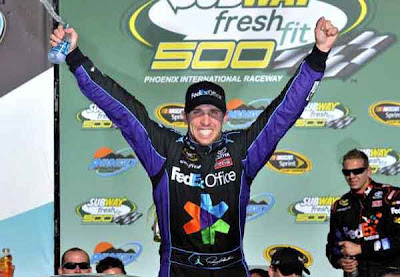 Denny Hamlin ran a good race at Phoenix finishing first in the Subway Fresh Fit 500 keeping contender Kevin Harvick at bay in the final laps. 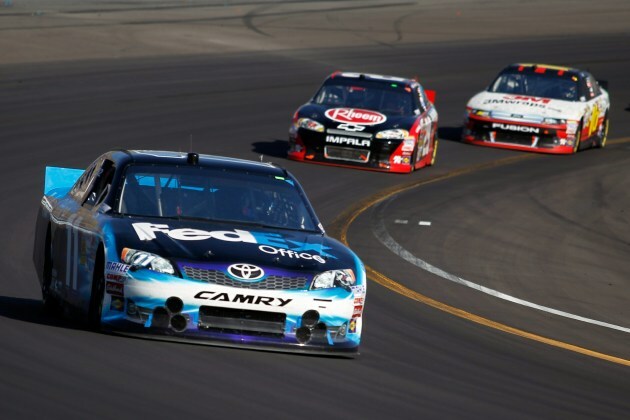 Lucky for Hamlin, Harvick lost fuel pressure with only two laps to go, but still managed a second place finish. "I don't know where this came from," Hamlin said. "We were solidly off in practice. We were off, but we kept getting it better and closer and closer to being competitive, but I had no idea that we were going to fire off like we did today." This track was not as good to him in 2010 when his Championship run was dashed with a poor finish. 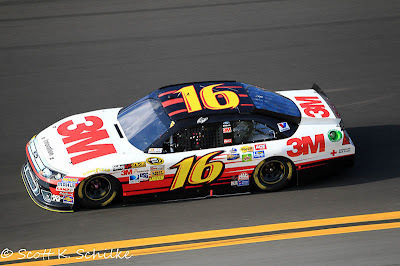 Greg Biffle placed third placing him in second in points following his third place finish at Daytona. Matt Kenseth finished in fourth place leaving him fourth in points. 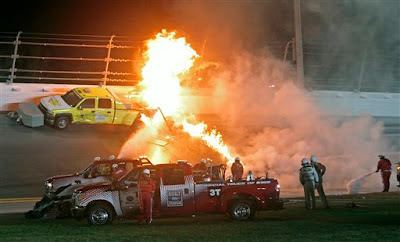 In other news, NASCAR officials penalized Jimmie Johnson 25 points for improper bodywork modifications at Daytona. 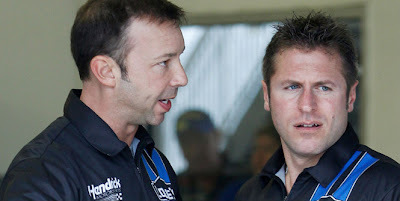 Crew Chief Chad Knaus and Car Chief Ron Malec have been suspended from the next six Sprint Car events. Knaus was also issued a $100,000 fine. The penalties were issued after inspectors found that the C-pillars of Johnson’s car were illegally modified. 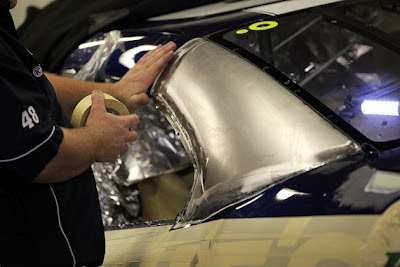 Officials cut the posts from the car requiring the Hendrick team to fly new parts to the track to be welded in prior to the final inspection. Unfortunately Johnson crashed in the opening laps of the race yielding only 2 championship points. Johnson started the Phoenix race with -23 points. Hendrick is appealing the ruling. DAYTONA BEACH, FL – This year, Daytona has certainly seen its share of Roush Yates race engine cross the finish line in first place. 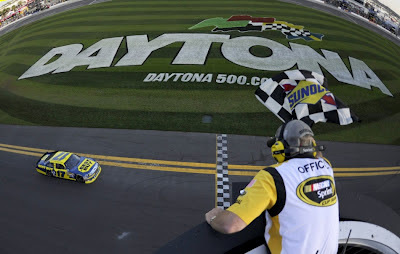 After taking top honors at the Rolex 24 Hour, qualifying two cars on the front row of the 500, winning one of the Duel 250s and on Monday Night, or rather, Tuesday morning they clinched the Daytona 500 with Matt Kenseth sailing across the finish line ahead of Dale Earnhardt Jr and teammate Greg Biffle. The Roush—Yates engines equipped with Burns merge collectors had plenty of power at the end though there were some water leaks early in the race. "We had a lot of problems -- it was spewing water," said Kenseth, who notched the 22nd Cup victory of his career. "I have to give a lot of credit to [engine builder] Doug Yates and the guys at the engine shop. We had great horsepower. I could get a pretty good start on the bottom and either Denny or Dale Jr. could push me for a while and then they just couldn't stay attached and I would get away from them just in time to get in front of Greg, and the two of us together could make some unbelievable speed. I have to thank Greg. We worked together really good all day long. He had a really fast car all day as well." Dale Earnhardt Jr. was pushing second place Greg Biffle on the last lap but they could not gain on Kenseth. "I was waiting and waiting," Earnhardt said. "It looked like he might have been trying to make a move on the back straightaway, but nothing materialized there. Then we came off [Turn] 4, and I kind of waited till the last minute for him to have his opportunity to try to pass Matt, and nothing was happening, so I just pulled out and went around him." Denny Hamlin finished 4th with Jeff Burton rounding off the top five. 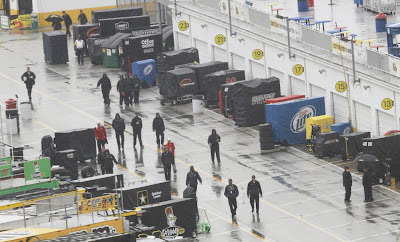 This Daytona 500 will go down in the books as probably the most bizarre in its history. Not only was the start delayed due to rain (first time in its 54 year history), Juan Pablo Montoya also crashed into a jet drier causing a great ball of fire (SEE VIDEO), and the wild action in the closing laps of the race added to a once-in-a-lifetime experience. On lap 160, Montoya pulled into the pits complaining of a transmission problem. After getting an all-ok from the pit crew, Montoya went back out on the track under a yellow, but lost control of the car and slammed into a jet dryer parked against the outside wall. The jet fuel on the dryer was ignited by the impact and the resultant blaze lit up the dusk sky. "Something failed in the rear of the car, and the car just spun into the jet dryer," Montoya said after a visit to the care center. "I left the pits and felt a really weird vibration, and I came back in and checked the rear end and [they] said it was OK, and I got into the back straight and we were going in fourth gear but wasn't going that fast. Every time I got on the gas, I could feel the rear squeezing. When I was telling the spotter to have a look how the rear was moving, the car just turned right." This race was also Danica Patrick’s debut in Sprint Cup. 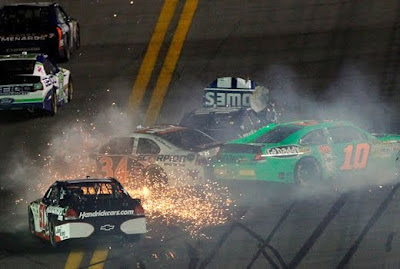 Unfortunately for her, Trevor Bayne and Kurt Busch were taken out in an accident.